A regulatory-driven shift from responding to contamination to preventing it. The US Food and Drug Administration (FDA) Food Safety Modernization Act (FSMA) was signed into law by President Obama in January 2011. It aims to ensure the US food supply is safe by shifting the focus of federal regulators from responding to contamination to preventing it. FDA FSMA includes preventive controls for Human Food and Animal Food; contains specific requirements for Foreign Food Suppliers and Importers; and identification of Preventive Controls Qualified Individuals just to name a few. The Food Safety Modernization Act gives the FDA authority for the first time to ensure that imported products meet US standards and are safe for US consumers, and specific requirements are in place for Foreign Supplier Verification. 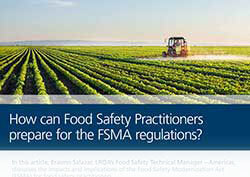 It is important for organisations impacted under FDA FSMA – as well as their suppliers – to obtain certification to a GFSI-recognised standard such as FSSC 22000 for Food Manufacturing and Packaging, FSSC 22000 for Animal Food, or the BRC Global Standard for Food in order to help further ensure compliance with FSMA requirements. The FDA Food Safety Modernization Act introduces requirements beyond HACCP, called Hazard Analysis and Risk-Based Preventive Controls or HARPC. HARPC encompasses far more in the way of food safety assessment and control than a traditional HACCP plan. The FDA Food Safety Modernization Act (FSMA) Preventive Controls for Human Food rule and the FDA Food Safety Modernization Act (FSMA) Preventive Controls for Animal Food are both now final, and compliance dates for some businesses begin in September 2016. The FDA has engaged the Illinois Institute of Technology to develop a recognised training course to satisfy the requirements around the PC Qualified Individual, including gaining a full understanding of the regulations around the Preventative Controls for Human Food. LRQA offers the FDA-recognised FSPCA Preventive Controls for Human Food course in both public and onsite settings. In the food safety arena, our services include certification and assessment services to FSSC 22000, ISO 22000, HACCP, BRC, the Global Markets Programme, GMP+ Feed as well as a range of regional and national food safety standards and schemes. We also offer second party audits, customised audit programs and training to help you drive client confidence in your food supply chain. LRQA works with over 5,000 food organisations and their supply chains, from the world’s top brands to the smallest independent suppliers. The technical know-how and project management expertise of our globally renowned, experienced and highly trained food safety experts ensures that we can adapt our assurance services to your business needs. 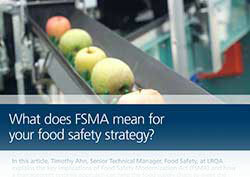 Find out about the Foreign Supplier Verification Program (FSVP) and its relation with FSMA. Thales Australia is part of a leading international electronics and systems group serving the defence, aerospace and space, security, and transport markets in Australia and around the globe.